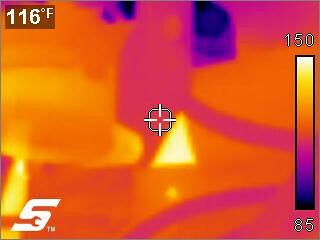 From a thread at VMF I decided to run some tests using thermal imaging to see what the effect of the exhaust riser crossover under the carb in the intake manifold was with regards to heat soak. We talk about it a bit at https://forums.vintage-mustang.com/vintage-mustang-forum/1140566-initial-timing-dummies.html#post9983340 . The car in question isn’t too far from me here in the valley. Same sort of environmental issues. 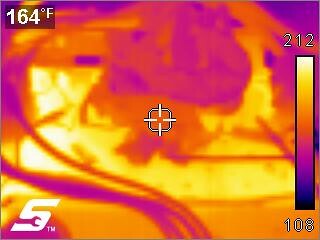 So I decided to shoot some images over 10-15 mins to see what the heating characteristics are like in a 289 2V. I’m not so sure the conclusion of it absolutely needing to be done to prevent engine overheating is accurate. Less heat anywhere is great but in the whole scheme of this it doesn’t look to be that significant of a contributor to manifold heat soak compared to the heads and engine. That’s not to say it won’t help but I don’t see it as being the one big thing in these conditions but one of many things. In this environment there are other factors that are greater contributors than the crossover as far as heating the manifold. In terms of boiling the fuel this absolutely appears to be a root cause as is the heating of the steel fuel line coming to the carb. Ambient temps about 116* in the garage. Outside it was 4-5 degrees cooler. I’ve got a 24″ turbine fan blowing at the radiator opening but it’s not near as good as driving it down the road. 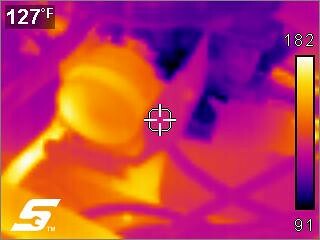 Plain water in the cooling system. Here are the shots about 2 mins after the start. 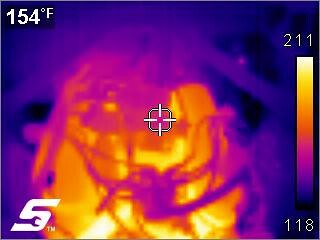 This one is driver side, the bright orange/yellow part is the exhaust crossover. Hot right away because, well, exhaust gas is hot. You can see the outline of the throttle linkage. This is the other side. You can see the choke is hot as well. About five mins into it. Driver side. The crossover is still hot but the bulk of the temp is now coming from the front and heads. Passenger side, 4-5 mins. 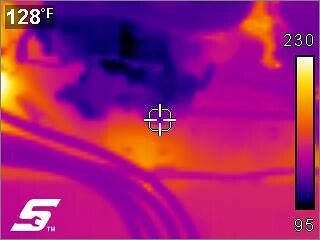 The hot spot at the S in the lower left is the heater hose. The crossover is more or less maintaining the same heat pattern but everything else around it has come up to temp. About 8 mins, driver side. 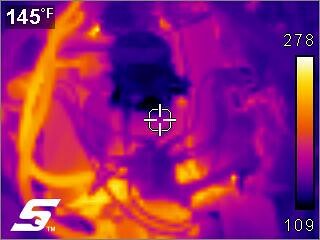 You can see the heat creeping up from the heads but under the carb is cooking from the crossover. 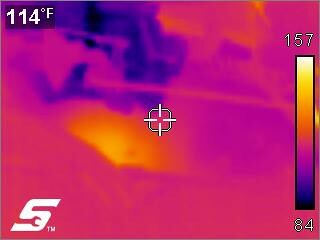 Passenger side fully cooking at 7-8 mins. Crossover looks to be about 50-60* hotter than when we fist started. This is the whole thing from the font. 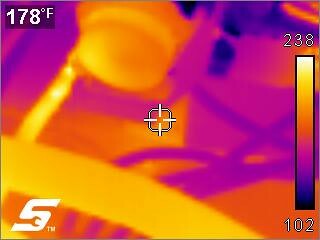 The temp signature is different as the imager is further back but the point of these tests are to show relative heat distribution, not absolute temps. We care more about what proportions are getting hotter and where they are rather than what a specific reading might be. 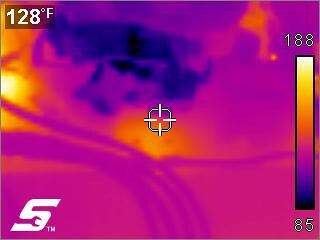 In this case the manifold is more or less evenly heated in the middle by the carb compared to the front and rear though under the throttle linkage you can see a blip that’s considerably hotter. Now check out the soak. This is after it’s been off for a minute or two. Driver side. YOWZA!! It’s an oven fest once the water stops circulating. But no boil over and the temp gauge is just over half way. I’ll repeat parts the test once I get a proper temp gauge installed next week so we have a reference with regards to coolant temp.